True stories of the lives of famous people quickly move to the top of the best sellers' charts. Listen to this series about the engrossing story of the life of Christ as told by a once-hated tax collector, Matthew. 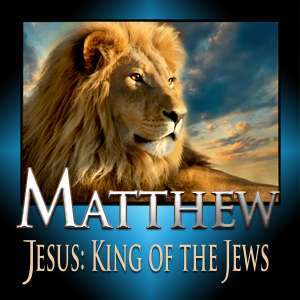 See how his emphasis is on Christ as the promised Messianic King. Find out about the not-to-be-missed practical ways this Gospel can impact your life. To view all video Bible studies in the Matthew series, click here. Lust. Sexual immorality. Faithfulness in marriage. Does Biblical teaching about these make you squirm uncomfortably? Listen to this lesson to see how Jesus once again sets a higher standard than the Pharisees and scribes by focusing on what we think rather than what we do. See the meaning of "plucking out your right eye" and "cutting off your right hand". On the issue of divorce, notice how Jesus points out that we should think of marriage in terms of a lifelong commitment. Learn some Biblical reasons for divorce and remarriage and how when we make wrong decisions, God's grace still forgives us. Realize that personal righteousness is a heart matter, not a matter of rule-keeping. What's your knee-jerk reaction when you think of someone slapping you on the cheek? Listen to this lesson to see what Jesus meant when He told His disciples to "turn the other cheek". Understand the law of retribution and the figures of speech Jesus uses in this passage. See how you should not use God's name or something in nature to convince others that you are telling the truth. Learn the importance of grace orientation when dealing with evil people just as Christ "turned the other cheek" when He died on the cross for sinners. Okay, so you socked someone and knocked out their tooth. Should your punishment be to have one of your teeth knocked out? Listen to this lesson to learn what the Bible means when it says "an eye for an eye, and a tooth for a tooth." Investigate the meaning of some common idioms and figures of speech. Understand the concept of retribution. See how we are to act when someone is mistreating us personally. Be ready to respond joyfully and treat others in grace and generosity just as God treats us in grace. If we only love those who love us, then how are we Christians any different from others? Listen to this lesson to learn what Jesus taught His disciples about the importance of love in the Sermon on the Mount. Inquire about two types of love in the Bible and see that loving our neighbor includes our enemies and those who treat us cruelly. Examine the positive and beneficial actions we can take to show our love for others. Understand that it is impossible to love others this way by our own efforts. Accept that this love comes as a by-product of a life spent walking by means of the Holy Spirit and learning and applying God's Word. "Hey! Look at me! Blow on that trumpet! Tell everyone I just dropped a lot in the offering plate." Listen to this lesson to learn how Jesus told His disciples to give, not just the act but the motivation behind the act. Notice what He promises about rewards. Understand how praying should be offered in private, never to show off what great prayer warriors we are. Find out the meaning and value of fasting. Affirm that God looks at the heart of each of us and that it's not what we do but why we do it that counts. "Our Father in Heaven, halloed be Your Name." How many times have we uttered those words in unison with others without really knowing what they mean? Listen to this lesson to learn what Jesus taught His disciples about prayer. Learn the many different titles that have been given to this prayer and about its three distinct sections. See the connection between trespasses and debts. Find out what application, if any, the prayer has for us today. Are we living in the kingdom of God now or are we still looking forward to it? Listen to this lesson to learn how the Bible describes the 1,000 year literal reign of Christ on this earth at His triumphal second coming. According to Scripture see that when the kingdom is here we will see God's will being done on earth as it is in heaven. Understand that God's name will be hallowed by all people in the future kingdom. Conclude that believers today are to ask God to meet their daily needs and understand the very real danger of Satan enticing us to sin. "Forgive him? You don't know what you're asking. He doesn't deserve to be forgiven." Listen to this lesson to see that believers can't expect to be forgiven by God for what they've done wrong when they're refusing to forgive others. Learn about four categories of forgiveness and how Christ died for the sins of all mankind but that forgiveness is only applied when someone trusts in Christ as their Savior. Learn how many times Jesus taught that we should forgive others and see that at times there are consequences to our sins even when we're forgiven. "Ahoy, mate. Bring out the treasure map." Who wouldn't like to stumble over a treasure map that led to great riches? Listen to this lesson to learn that the Bible reveals where to find real treasure and how we can store it in a totally secure place. Learn what our attitude toward money should be and how we need to avoid finding our happiness in what we own. Let your generosity and use of money reveal your life's priorities as you realize that all of our resources are from God.